High performance portable hard drive! This SmartDisk FireLite FWFL80 external hard drive features an 80 gigabyte capacity, 5400 RPM speed and is encased in a unique magnesium alloy housing! Get fast transfer speeds with its IEEE 1394 FireWire interface and its palm-sized, durable and stylish design provides outstanding performance and capacity! 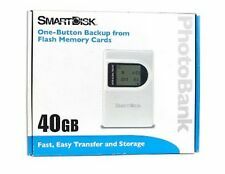 SmartDisk PhotoBank PB40 USB 2.0 Digital Photo Bank/Card Reader. SmartDisk Digital PhotoBank. SmartDisk PhotoBank Model: PB40. USB 2.0 interface. USB mini-B port. Secure Digital. Silver color. Available USB port. Used in acceptable condition. There are moderate scuffs to finish. There is a small mark with sharpie marker to one corner. NO LOCAL PICK UP! We are happy to help get the part you need! Great condition. We will try to give you as much information about an item as we can. By utilizing this system we both can see all correspondence related to a specific item. SmartDisk FireLite USBFLB60 60GB Portable Hard Drive TESTED Working FireWire. Used. 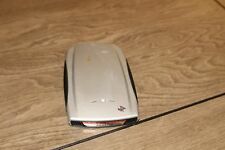 Fully tested, It comes without box and without manual or accessories, only what is seen in the photos is being sold. It is in good condition and works well. About the item: This item is associated with the following MPN(s): USBXF160F. The CrossFire external hard drive instantly adds high-performance storage in an attractive design for your PC or Mac. WE WILL BE HAPPY TO WORK OUT ANY PROBLEMS/ISSUES RELATING TO YOUR ORDER. Saving and storing digital photos using the pocket-sized FotoChute is convenient, portable and safe. FotoChute also connects directly to a PC to offload photos for sharing with family and friends. FotoChute is a Hi-Speed USB device that can act as a host or slave. Smart Disk 250GB NetDisk Hard Drive Model END250 Ethernet. Requires mini USB for use. I use a white backdrop in an effort to represent the item clearly, but colors can be slightly different in different lighting or objects may appear smaller/larger. SMARTDISK 120GB 7200 RPM FireWire Desktop Hard Drive FREE SHIPPING 📮📦!!l👀k!! Never been used, comes with USB cord. SmartDisk FireLite 160 GB Portable Hard Drive Working FireWire Port. Condition is Used. Shipped with USPS First Class Package. Used, not tested. No power adapter. We do our best to test and describe every item honestly. About the item: This item is associated with the following MPN(s): FWFL80. The "drive for perfection" is built into our line of FireLite portable external drives. Quite simply, FireLite provides quality without compromise. About the item: This item is associated with the following MPN(s): FWFL60, T5934LL/A. The "drive for perfection" is built into our line of FireLite portable external drives. Quite simply, FireLite provides quality without compromise. USED IN GOOD CONDITION, NO CABLES. About the item: This item is associated with the following MPN(s): USBFLB40. The "drive for perfection" is built into our line of FireLite portable external drives. Quite simply, FireLite provides quality without compromise. This is a great Firewire portable hard drive. It is powered off of the firewire port. 3 x SmartDisk 12GB Mini USB 2.0 Portable Hard Drive USBMD12. Units fully work, Tested and reformatted. About the item: This item is associated with the following MPN(s): USBFLB100. The "drive for perfection" is built into the line of FireLite portable external drives. Quite simply, FireLite provides quality without compromise.FireLite's diminutive size and weight are made possible through the use of magnesium alloy for the drive's housing - by weight, one of the strongest materials on the planet. Bus powered ?. WE WILL BE HAPPY TO WORK OUT ANY PROBLEMS/ISSUES RELATING TO YOUR ORDER. About the item: This item is associated with the following MPN(s): XF160F. The CrossFire external hard drive instantly adds high-performance storage in an attractive design for your PC or Mac. WE WILL BE HAPPY TO WORK OUT ANY PROBLEMS/ISSUES RELATING TO YOUR ORDER. About the item: This item is associated with the following MPN(s): USBFLB60. The indrive for perfectionin is built into our line of FireLite portable external drives. Quite simply, FireLite provides quality without compromise FireLites diminutive size and weight are made possible through the use of magnesium alloy for the drives housing -- by weight, one of the strongest materials on the planet. The CrossFire external hard drive instantly adds high-performance storage in an attractive design for your PC or Mac. WE WILL BE HAPPY TO WORK OUT ANY PROBLEMS/ISSUES RELATING TO YOUR ORDER. About the item: This item is associated with the following MPN(s): CF250. Requires FireWire cable for use. I use a white backdrop in an effort to represent the item clearly, but colors can be slightly different in different lighting or objects may appear smaller/larger. SmartDisk FireLite 80GB Portable Hard Drive TESTED Working FireWire Port. Condition is Used. Shipped with USPS First Class Package. I use a white backdrop in an effort to represent the item clearly, but colors can be slightly different in different lighting or objects may appear smaller/larger. The disk is gently used and is clean. P/N: XF250. Model: CrossFire. USB 2.0 and IEEE 1394 FireWire interfaces. One (1) USB 2.0 port. AC Adapter (100-240V, 50/60Hz). Available USB or FireWire Port. Speed: 7200 RPM. Two (2) 6-pin FireWire ports. Working hard drive, has been swapped for 30GB HD. Fresh wipe on the drive and is formatted for Mac, but is PC compatible (if reformatted). I use a white backdrop in an effort to represent the item clearly, but colors can be slightly different in different lighting or objects may appear smaller/larger. One (1) AC power adapter port (for optional use with SmartDisk 5 VDC power adapter only, not included). Series: FireLite. One (1) hi-speed USB 2.0 port (USB 1.1 backwards compatible). USB interface. Available USB port. USBFLB80CA – SmartDisk FireLite 80GB 5400rpm USB External. MANUFACTURER PN: USBFLB80CA;. Here is the product information from SmartDisk Easily and automatically back up your personal content. FireLite is the perfect solution to your data storage needs. Read and writes high density 3.5" floppy disks, self powered via USB. By purchasing an item/product. x, or MAC OS X10.1 or higher. THIS ONLY as noted per box. Item conditions, or markings etc may vary. EVS is an Authorized Two Way Radio Dealer, Patrol, K9 & Command Vehicle Upfitter in Central California.